Click Here To Read the Milwaukee Electronics Newsletter Q2 2017! In the latest edition of the Milwaukee Electronics Quarterly Newsletter, we share several newsworthy items with you! Tecate, Mexico facility builds it’s 1,000,000th unit for a customer in less than 1 year! Click here to read: Milwaukee Electronics Newsletter Q1 2017! 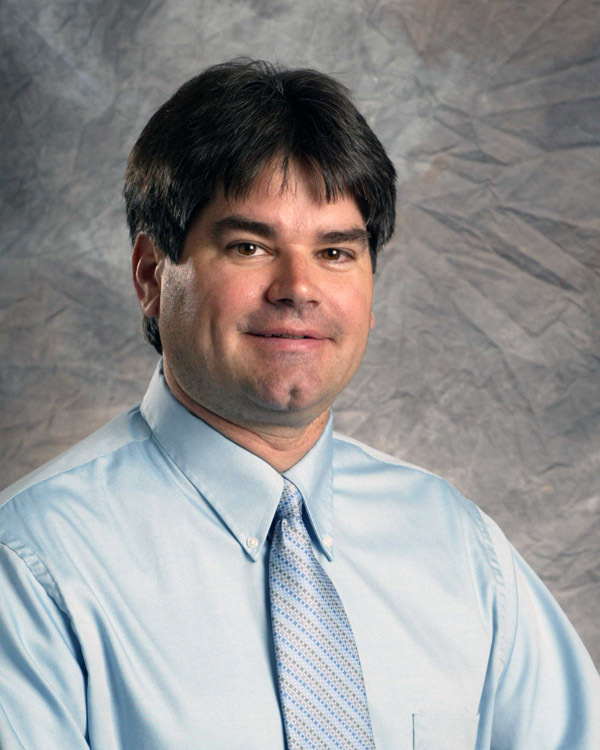 On behalf of Milwaukee Electronics, it is an honor to announce the newly promoted Technical Sales – Manager of Special Accounts in the Design Engineering group, Larry Holten. This position has been created in the Milwaukee, Wisconsin location to enhance Design sales growth in strategic account areas in our company due to their growth opportunities, in support of our electronic and PCBA manufacturing facilities. In addition, Larry will continue to act as the technical resource to the Corporate Sales Group for new opportunities, leads, and website updating. Our primary focus for this position, though, is being created to pursue account growth. 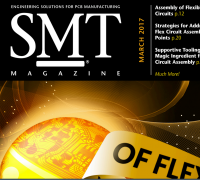 Read the conversation with Mike Galloway over at SMT Magazine. Download the PDF here. Over the last quarter, Screaming Circuits has upgraded the hardware and software on all its Mydata equipment. “Since we created Screaming Circuits, MyData machines have been an important part of our formula for success. 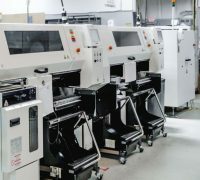 As we integrated a MY12 into one of our production lines, we saw the opportunity to make upgrades across all our MyData lines and standardize them,” said Ashley Rochholz, Screaming Circuits’ Manufacturing Manager. 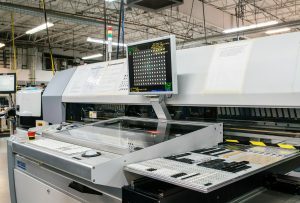 The upgrades included new cameras providing improved optics on all machines, software revision level upgrades, new hard drives and a new server. The optics are particularly important be-cause as a quick turn prototype house, Screaming Circuits must deal with a wide variety of component styles and packaging types. Not all received material places well. The upgraded optics are identifying issues faster and providing more detailed error codes, which decreases the time needed to correct the issue. The new server has reduced programming and offline setup time. The addition of the MY12 has also enabled the team to increase throughput. “With the addition of this machine, we were able to take an older MyData ma-chine offline. We are now using it to experiment with offline setup strategies, while the MY12 has provided some nice efficiency gains,” added Ashley. Ashley estimates that overall, the improvements have increased efficiency by 140 percent. 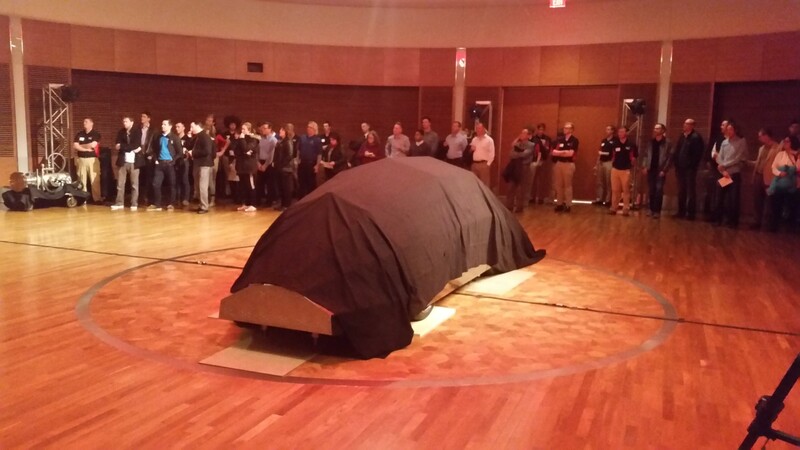 Milwaukee Electronics’ Operations Manager Terry Martin, Senior Director of Business Development Scott Pohlmann and Design Services Group Engineering Manager Larry Holten recently represented Screaming Circuits at the Badgerloop Pod Reveal Event in Madison, WI. Screaming Circuits is one of many sponsors of this innovative engineering project and has provided prototype circuits. BadgerLoop is a student organization created to represent UW-Madison in the SpaceX Hyperloop Pod Competition. The competition seeks to innovate transportation with Hyperloop, an idea presented by SpaceX and Tesla Motors co-founder Elon Musk in 2013. Hyperloop transportation involves pod-like travel down a vacuum tube at high speeds. Badgerloop’s ultimate goal is to win the competition, but more than that, to help lay the groundwork for this innovative new transportation technology. The Badgerloop team revealed their pod on Dec. 6, at the Wisconsin Institute for Discovery to eager transportation enthusiasts, including University of Wisconsin-Madison students, industry sponsors and community members, in preparation for the SpaceX Hyperloop competition this coming January. The free event featured multiple aspects of the transportation pod, including displays of its motor, software components and magnet arrays. Representatives from many of Badgerloop’s 19 teams displayed and explained their work on the prototype, demonstrating that Hyperloop is more than a transportation dream. Last January, Badgerloop placed third at Design Weekend, the initial phase of the Hyperloop pod competition sponsored by SpaceX. Badgerloop was the only team comprised primarily of undergraduate students. In January of 2017, Badgerloop will attend competition weekend at SpaceX headquarters in Hawthorne, California and test their pod on SpaceX’s mile long test track. 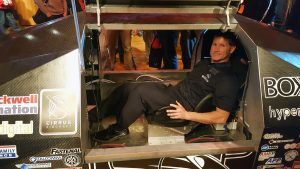 Above, Milwaukee Electronics’ Operations Manager Terry Martin sits in the Badgerloop vehicle.